Cost-distance corridor with the main trade routes between Nuremberg and Leipzig and average customs revenues between 1469 and 1550. The map shows that the costliest route (in terms of distance and slope) attracted more traffic than the less costly routes, which raises questions about what determined pre-modern patterns of mobility. The following two maps are part of a broader analysis and critique of the polygon as the main vector data model for representing political entities in spatial history. Number of foreign subjects enserfed by the Electors Palatine in 1665. 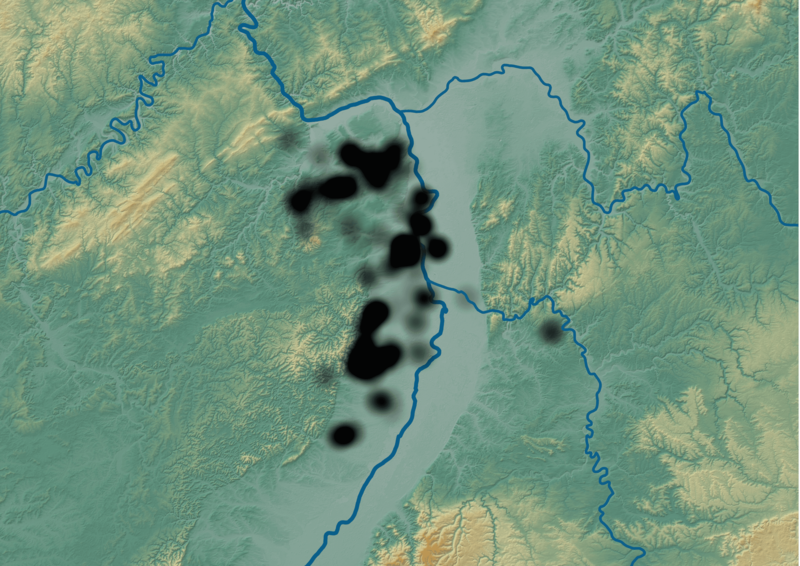 The map shows that the spatial extent of the Palatine incursions in the neighboring territories were much more limited than previously assumed (the light grey area). 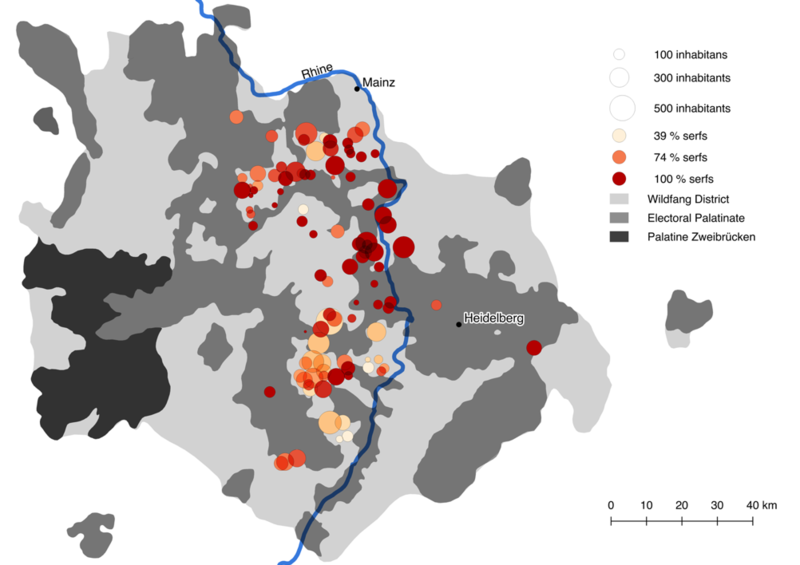 The elevation profile of the region shows that most of the serfs lived in the Rhine Rift Valley and in Rhenish Hesse, areas with fertile soils and a warm climate. The villages in these areas were easily accessible and more densely populated, offering a larger tax base. The following graphs study the language used in the titles of more than ten thousand legal dissertations defended at German universities during the seventeenth century. They are part of an ongoing project that explores broader temporal and spatial shifts in early modern legal and intellectual history. This graphs highlights the rise of religious language – i.e. the relative frequency of words like religio or charitas – which points to an increasing “juridification” of religious matters in the wake of the Thirty Years’ War. This visualisation captures the decreasing relative frequency with which students worked on classic texts of Roman Law, such as the pandectae or digesta, at a time at which jurists began to pay increasing attention to customary and natural law. This graph shows the decreasing relative number of students who worked on usucapio, i.e. the acquisition of ownership through possession (similar to squatting). In a society where landowners and princes often lacked formal titles of ownership, usucapio was a crucial mechanism for securing the political and economic status quo. While I cannot yet explain the decreasing interest in usucaption, it points to profound changes in the ways in which power and property were challenged and defended in the course of the seventeenth century.